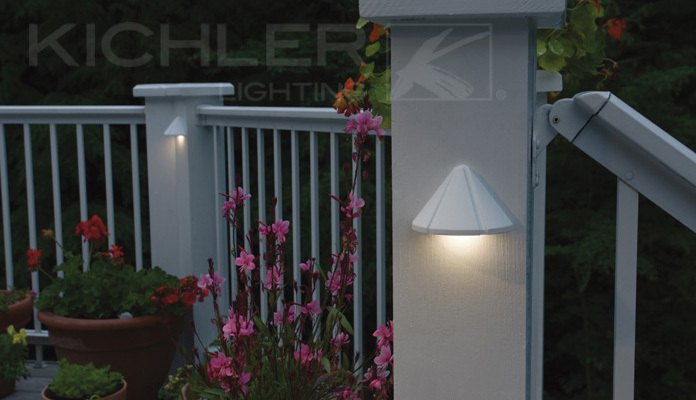 Gather beneath the beauty of LED The places people gather the most are a perfect match for Kichler Design Pro LED technology. Ensure a great night under the stars is never without the right light. Light so pure and clean it accents rather then interferes with the setting. 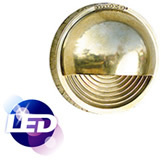 19th Century charm with the energy efficient benefit of LED technology. Cool or Warm White LED. 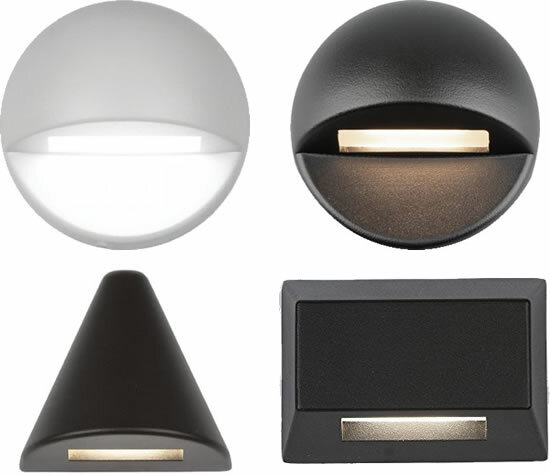 Width 1.5" x Height 9.5"
Width 1.5" x Height 15.5"
Width 3.5" x Height 2"
Diameter: 2.25" x Height 0.38"
Diameter: 1.38" x Height 1.5"
Diameter: 3/4" x Height 1"
Easy installation, low voltage usage, low profile (.66" wide) and low heat output of Design Pro LED enables them to be used in a variety of outdoor applications. 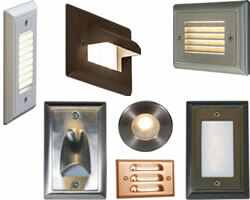 Thoughtful design, so whether new or existing construction, you can design effectively and install it efficiently. 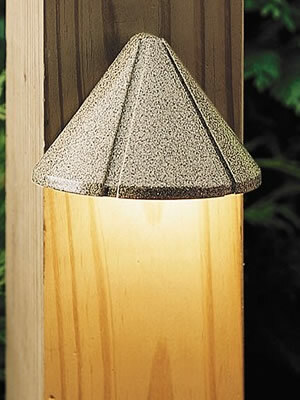 A built-in driver and an operable voltage range of 9-15V virtually eliminate voltage drop in every Design Pro LED Hardscape, Deck, Step and Bench Light fixture. 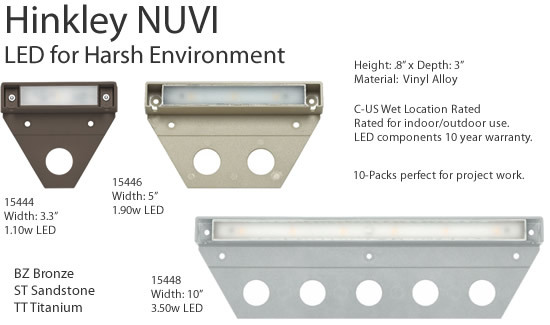 LED Light fixture and stainless steel mounting bracket are preassembled and ready to install. 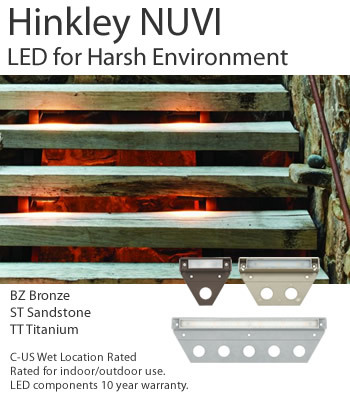 Need to mount on a flat or vertical surface? No problem. The available flat mount accessory brackets (15716SS, 1517SS, 1518SS, 1519SS) allow for a variety of retrofit and new build applications. Don't need the brackets? Don't pay for them. 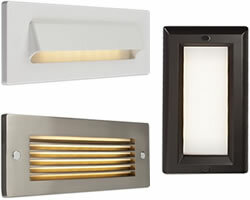 Kichler provides the product options that make it convenient for your specific job. 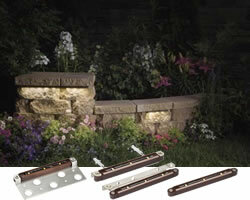 For non-hardscape applications, the threaded screw holders also allow for easy install. 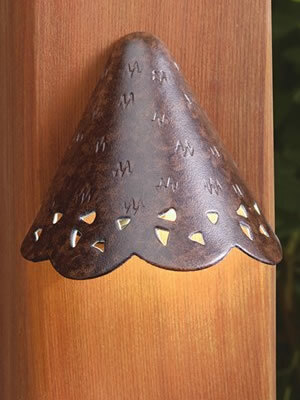 In fact you can mount these LED fixtures on any surface where you can drill two holes. 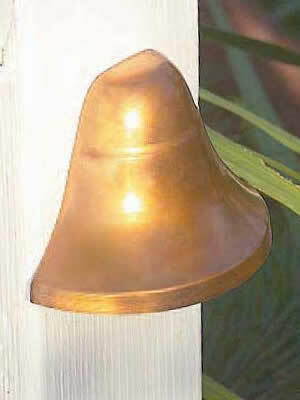 Finish: Natural Copper is bright polished, untreated copper. 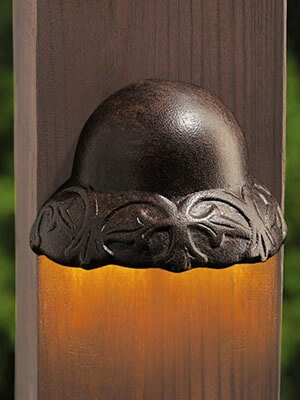 Color will age naturally to a fine dark copper patina. GADL20: Spun solid copper. Copper back plate. 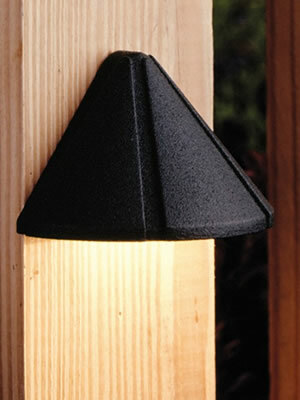 LAMPING: 12W maximum wedge base T3-¼ lamp. 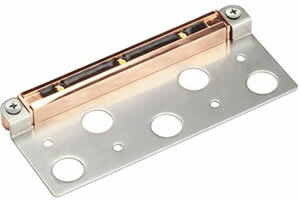 10W wedge base T3 ¼ (xenon) lamp is included with fixture. Xenon lamp life is approximately 10,000 hours. Lamp does not need to be protected and can be directly handled. ELECTRICAL ASSEMBLY: Wedge base socket type (T3-¼ or T5). 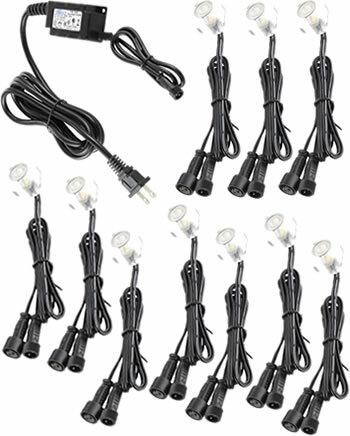 12 volt fixture is pre-wired with 6-ft. pigtail of 18-2 AWG, 105° C, SPT-1W wire. Low voltage quick connector, catalog #LVC3 included for easy hook-up to the low voltage supply cable, not included. 12 Volt system requires remote transformer, not included. OPTICAL ASSEMBLY: Reflective white powdercoat on underside of roof. INSTALLATION & MOUNTING: Two (2) Stainless #8 wood screws (supplied) via key slots. 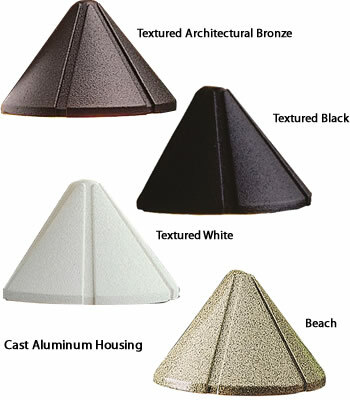 Housing: One-piece injection molded ULTEM® High Performance Polymer composite. Fasteners are 300 Series stainless steel. 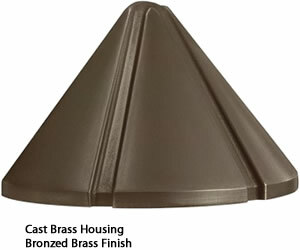 Housing: Die-cast brass. Fasteners are 300 Series stainless steel. 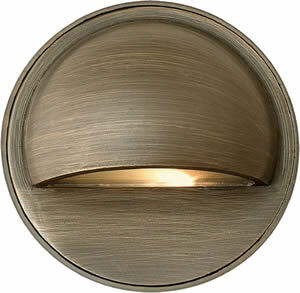 Finish: Natural Brass (N) is as-cast and tumble polished. Housing: Die-cast aluminum. Fasteners are 300 Series stainless steel. Finish: Thermoset polyester powdercoat is electrostatically applied after a five-stage conversion cleaning process and bonded by heat fusion thermosetting. Laboratory tested for superior weatherability and fade resistance in accordance with ASTM B-117-64 and ANSI/ASTM G53-77 specifications. Lamping: 18W maximum S-8 (1141) lamp. 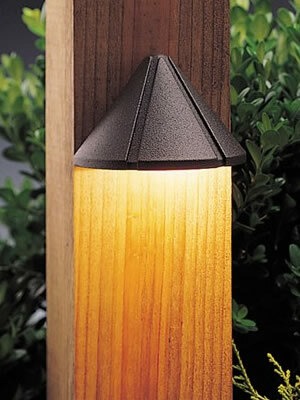 Lamp is included with fixture. Lower wattage lamps are acceptable. Installation: & Mounting: Two (2) Stainless #8 wood screws (supplied) via key slots. Optical Assembly: Frosted tempered glass lens. Electrical Assembly: Single contact bayonet (S-8). 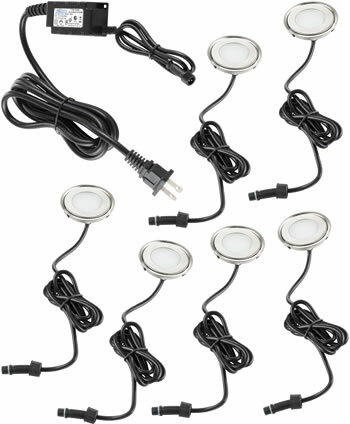 12 volt fixture is pre-wired with 6-ft. Pigtail of 18-2 AWG, 105° C, SPT-1W wire. Low voltage quick connector, catalog #LVC3 included for easy hook-up to the low voltage supply cable, not included. 12 Volt system requires remote transformer, not included. ELECTRICAL ASSEMBLY: Single contact bayonet (S-8). 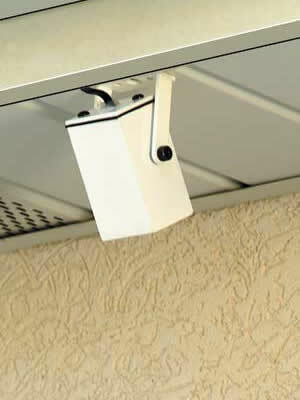 12 Volt fixture is pre-wired with 8-ft pigtail of 18-2 AWG, 105° C, SPT-1W wire. Low voltage quick connector, catalog #LVC3 included for easy hook-up to the low voltage supply cable, not included. 12 Volt system requires remote transformer, not included. 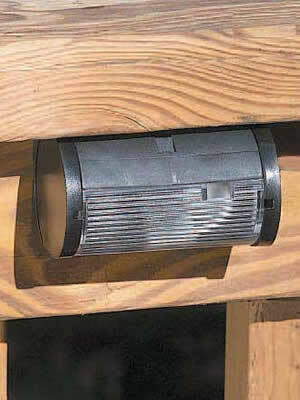 HOUSING: Machined aluminum top cap and cast aluminum body with adjustable yoke. Fasteners are 300 series stainless steel. Finish: Thermoset polyester powdercoat is electrostatically applied after a five-stage conversion cleaning process and bonded by heat fusion thermosetting. Laboratory tested for superior weatherability and fade resistance in accordance with ASTM B117 specifications. LAMPING: 10W maximum T3 bi-pin lamp. 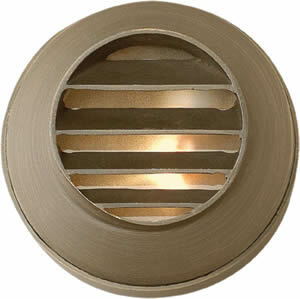 10W T3 lamp is included with fixture. Lower wattage lamps are acceptable. ELECTRICAL ASSEMBLY: Bi-pin socket type (G4) with 250° C high temperature teflon coated wire leads. 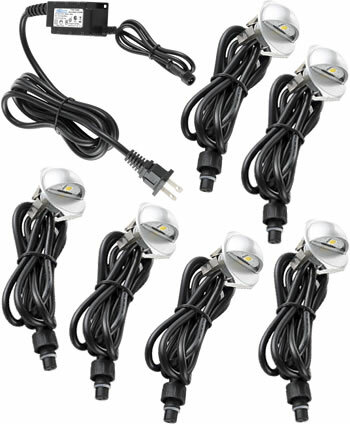 12 volt fixture is pre-wired with 6-ft. pigtail of 18-2 AWG, 105° C, SPT-1W wire. Low voltage quick connector, catalog #LVC3 included for easy hook-up to the low voltage supply cable, not included. 12 Volt system requires remote transformer, not included. 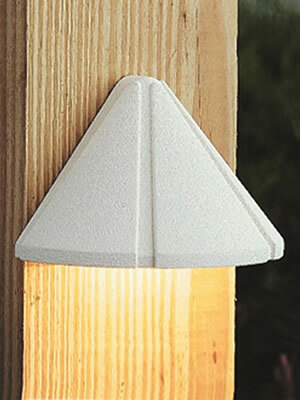 HOUSING: Injection-molded RYTON® composite and polycarbonate. Fasteners are 300 series stainless steel. Finish: Thermoset polyester powdercoat is electrostatically applied after a five-stage conversion cleaning process and bonded by heat fusion thermosetting. Laboratory tested for superior weatherability and fade resistance in accordance with ASTM B117 specifications. Composite is textured, pressure formed, molded-in-color.